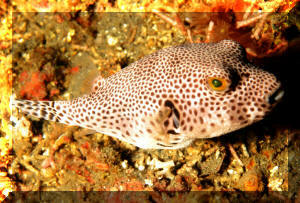 Arothron reticularis (Bloch & Schneider 1801), the Reticulated Puffer. Indo-west Pacific. To sixteen inches in length. Here's possibly a juv. one hiding behind some algae in N. Sulawesi. Arothron stellatus (Bloch & Schneider 1801), the Starry Toado. Indo-Pacific, Red Sea, east coast of Africa. To forty eight inches... not a misprint, yes, four feet in length. For huge systems only... and devoted puffer lovers. A captive specimen of about ten inches length and two individuals in N. Sulawesi and Gili Air, Lombok, Indonesia. The last of much larger size (about two feet overall). Chelonodon laticeps Smith 1948, the Bluespotted Blassop. Western Indian Ocean (South Africa) and Papua New Guinea. To eight inches. Brackish to Marine. 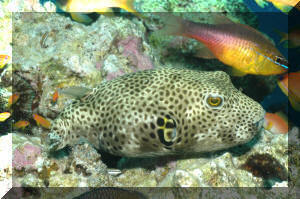 Chelonodon patoca (Hamilton 1822), the Milkspotted Puffer. Indo-Pacific. To eleven inches long. Prized by some Japanese as a food fish. Chelonodon pleurospilus (Regan 1919). Southwest Indian Ocean (river mouths of South Africa). To eight inches in length. Contusus brevicaudus, Hardy 1981. Southwestern Pacific: known from southern Australia. To ten inches in length. Nocturnal. Contusus richei Freminville 1813, the Prickly Toadfish. Indo-west Pacific. Temperate. To ten inches. Feroxodon multistriatus (Richardson 1854), the Manystriped Blowfish. Indo-West Pacific: northwestern Australia and elsewhere in the region but mainly southwest Pacific. This puffer is responsible for clipping off swimmer's toes! 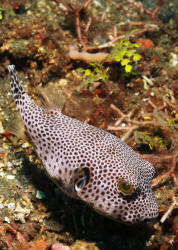 Guentheridia formosa (Gunther 1870), the Spotted Puffer. Eastern Pacific: from Costa Rica to Ecuador. To ten inches in length. Carnivorous.